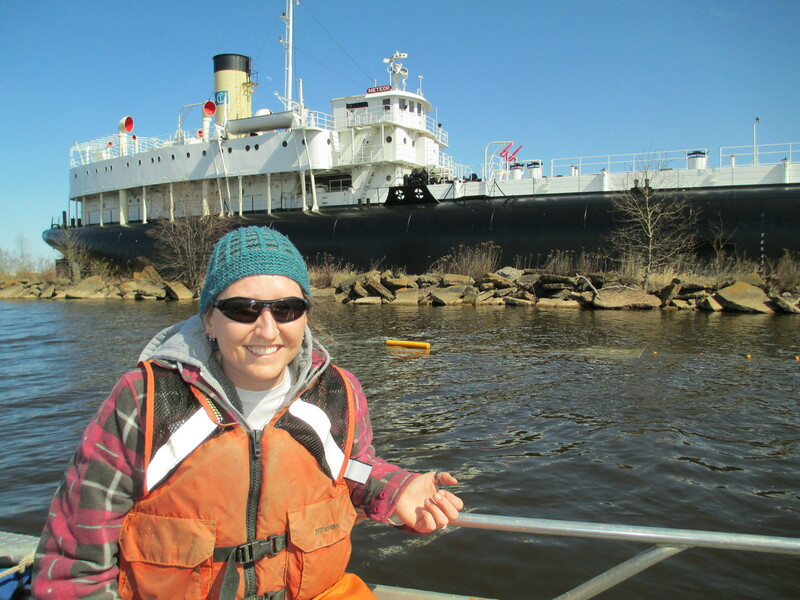 Michelle Gutsch on the R/V Blue Heron during the Lake Superior Ruffe research cruise. 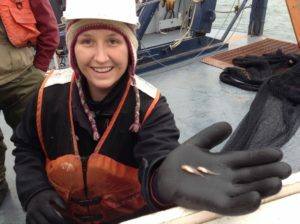 She is holding the only two Ruffe captured the whole day. 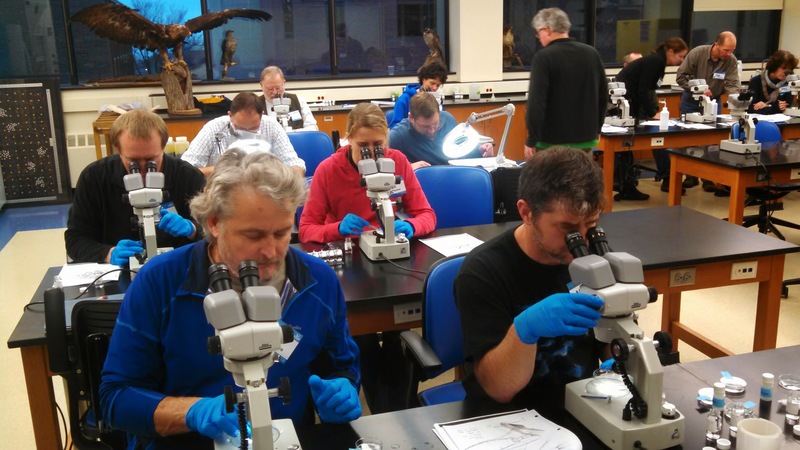 Michelle Gutsch teaching educators how to identify a sucker (Catostomidae). 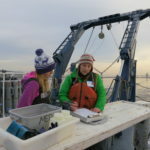 Michelle teaching a participant how to record data aboard the R/V Blue Heron. Educators diligently working during the “Dig-in-Day,” a lab day planned by Michelle Gutsch and others to teach educators how to process laboratory samples. 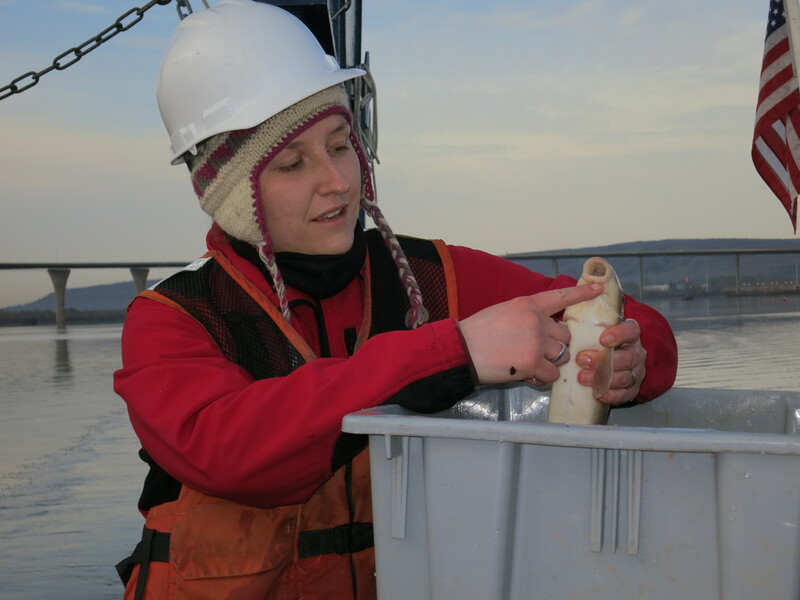 Michelle Gutsch sampling for Ruffe by Barker’s Island. 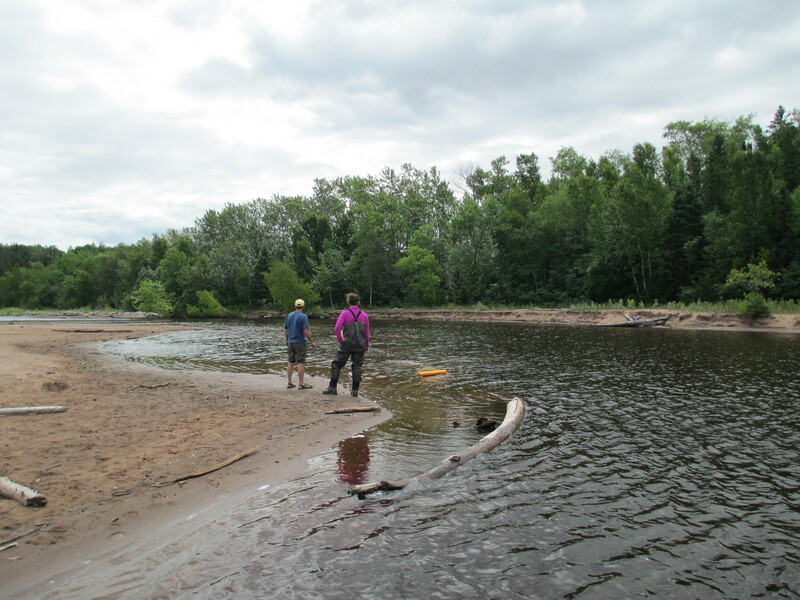 Michelle Gutsch and Greg Peterson assessing the fyke net we set in the Amnicon River, WI. 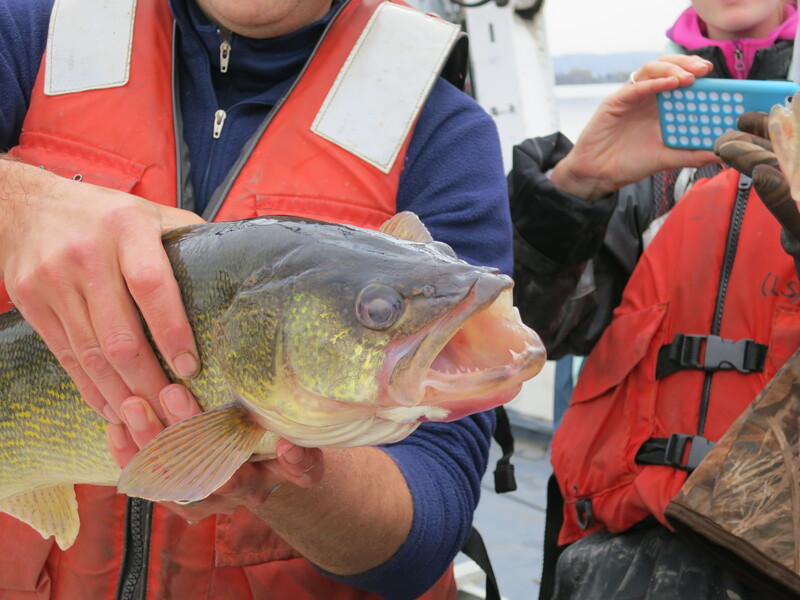 Walleye (Sander vitreus) we caught while bottom trawling aboard the R/V Blue Heron for one of the Ruffe cruises. I first became interested in science when I took a biology class my sophomore year of college. I had an amazing professor at the University of Wisconsin Superior, and he inspired me to go on to become a professional scientist. 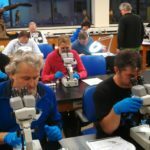 After earning my MS in fisheries from the University of Alaska Fairbanks, I came back to the Twin Ports and decided to apply for the Integrated Biosciences program at UMD. I chose Dr. Joel Hoffman, US EPA, as my advisor and Great Lakes research as my subject. I just received my PhD in November of 2017! I study invasive species, specifically a small fish called Ruffe, and everything there is to know about Ruffe—their life history, trophic pathways, and population dynamics. For my PhD research I built a species distribution model that predicts suitable habitat for Ruffe in Lake Superior. 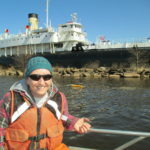 I was the chief scientist for two research cruises that each included 10 regional educators. 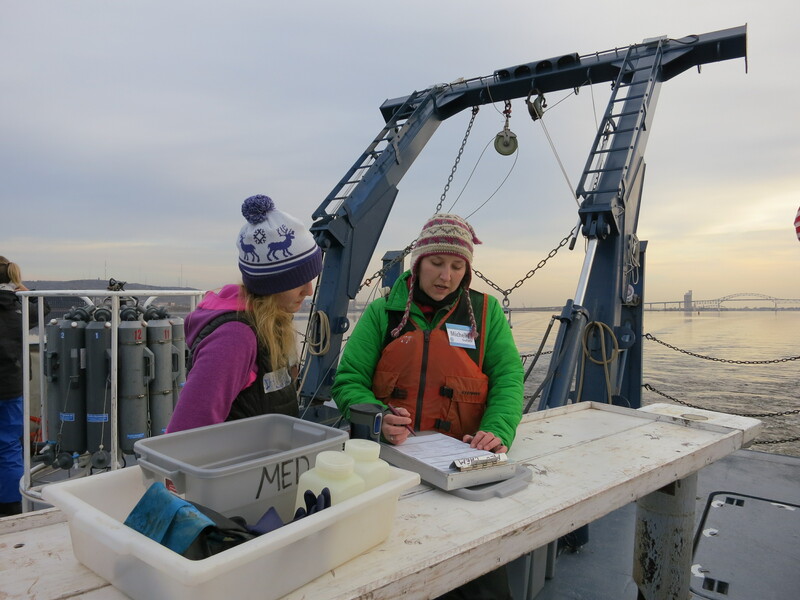 For the research cruises, the educators learned how to deploy an otter trawl (NOT for catching otters!) 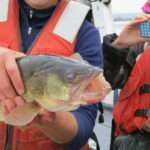 and identify fish, deploy a CTD (an instrument used to measure the conductivity, temperature, and depth or pressure of lake or sea water), deploy a zooplankton net and sieve the samples, deploy a PONAR (a device for collecting samples from the bottom of the lake) and filter the mud to look for invertebrates, and do a Secchi disk test (an estimate of water clarity). 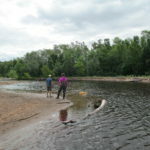 We were out for the entire day (~12 hours) for both cruises, one day in Lake Superior and one day in the St. Louis River. These cruises were at the end of October and beginning of November, so it was freezing. What surprised me the most was that not once did I hear anyone complain. I have been out with so many science crews doing many different projects, and there are always people complaining about the conditions or the work. All of the educators were so happy to be there, and everyone worked hard all day. I think sharing our work with educators is extremely valuable because by educating the educators, we are making our research accessible to the next generation of young minds. We are not out there directly teaching K-12 students. We need to convey our important scientific messages to them somehow, and their educators are that very important vessel of knowledge. Critical skills for students interested in science include the ability to study hard and never give up on a question—persistence, focus, diligence, and discipline.